Thanksgiving weekend is the busiest and most-dreaded travel period of the year, due to the compact date range and the fact that there's inevitably almost always some sort of weather disaster at one of the nation's major airline hubs. But if you're still brave enough to do it, here's how to get through it unscathed. It's already October. Many cities already have a cool crispness in the air, changing leaves, and lines of young girls in yoga pants at every Starbucks, eager for a Pumpkin Spice Latte. Thanksgiving is just around the corner and you've got tickets to Grandma's house. Wait, you haven't bought your plane ticket? Well what are you waiting for? First off, if you haven't booked your flights already, do it now! CheapAir tracks 11,000 different holiday airfare markets on a daily basis, and they say prices are trending upward. Christmas is already trending higher than Thanksgiving. Holiday airfares are usually at their lowest around Labor Day, so you have probably already missed the best deals. Hoping to fly on points or miles? Good luck with that as well. Most airlines cap the number of freebie seats per flight, or have blackout dates on the busiest days of the year. If your airline does allow reward seats, they're probably long gone. 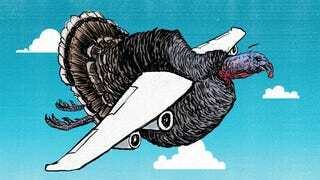 Try to avoid leaving on the Wednesday before Thanksgiving, known within the airline industry as "Black Wednesday." Also try not to go home on the following Sunday, traditionally the busiest air travel day of the year. Those two days are the most crowded and expensive days to fly. You'll find less crowds and perhaps cheaper flights if you burn an extra vacation day (which many people don't use to their full availability) and leave the Tuesday prior to Thanksgiving. And consider coming home a day early on the Saturday after Thanksgiving. No matter what day you fly, I highly recommend leaving early in the morning. Consider flying into secondary airports, too. They are typically less crowded, and may have cheaper prices as well. For example, if you're flying to the Miami area, consider Fort Lauderdale. For the Los Angeles region, check out Burbank, Ontario, or Orange County. You can avoid a long wait in the check-in line if you'll pack a carry-on sized suitcase. Plus, many airlines make you pay for that, unless you're in their Super Deluxe Executive Platinum Medallion club or whatever. Since you're on a morning flight as I advised, save that cash for a Bloody Mary at the airport bar. The industry standard for checked luggage size is (mostly) 9 by 14 by 22 inches, or 45 total inches. If you're on one of those tiny jets, you get to drop off your bag plane-side and they bring it right up to you when you land. You're going to have to go through the TSA checkpoint anyway, so you may as well lug your bag along. Yes, some will say that dragging your bag along isn't speedy at all, but I'd counter that with the time you're saving when you land and you don't have to wait for that bag to drop on the carousel. Plus, if your bag is with you, there's no chance of it getting loaded on the wrong flight. Something else that can save you some time is the mobile boarding pass. Most of us have smartphones, and most airlines now have apps on which you can download your boarding pass and even change your seat assignment. The mobile boarding pass saves you time by not having to stand in another line to get it printed at the airport. Yes you can print it at home, but save that pricey printer ink for something else. Airline apps also have push updates, which notify you of delays or gate changes. If you've ever been sitting in the gate area when everyone's phone gets the update simultaneously, it's pretty comical. Two more things on time saving — get to the airport early. Follow your airline's recommendations for when you should arrive. If you miss your flight, it's not the traffic's fault, the TSA's fault or the airline's fault. It's YOUR fault, because you didn't give yourself enough time. Nobody at the airport will feel sorry for you. Wear clothes that help make your TSA screening process go smoothly and quickly. Wear slip-on shoes, or tie your laces loose enough where you can easily slip them on and off. Avoid a belt if you can. If you need it as accessory, save it until after your TSA screening. I'm sure the fashion police will overlook your faux pas. If your pants need a belt to hold them up, buy new pants. Seriously. Now you get the idea. The key to saving yourself some time, money and frustration is to be flexible in your planing. Heed these tips and hopefully you'll get to your destination saying to yourself, "It wasn't that bad!" And if for some reason your trip turns out less than awesome, remember there are hugs from loved ones and pumpkin pie waiting on the other end. Do you have and tips or advice for fellow travelers? Let us know in the comments below.